We ALL have perfect lips. It’s just an individual preference on how you would like your lips enhanced. The “golden” rule for lips is that the lower lip should be 1.5x the size of the upper lip in Causasian ladies, and a 1:1 ratio for African American ladies. A prominent “Cupid’s bow” also helps the lips look more enticing. What is the product that you use? We use only FDA approved Juvederm products, of which the main ingredient is a hyaluronic acid gel. Hyaluronic acid is a naturally occurring sugar found in the human body. Its job is to deliver nutrients, hydrate the skin, and act like a cushion. Approximately 30 minutes, but could be longer with questions and explanations. We are in no rush, but maybe you are? How many injections will go into my lips? About 5 in the top and 5 in the bottom…sometimes more, and sometimes less. None really, but your lips may be tender for a couple of days. Small bruising and swelling are not uncommon, but easily covered with makeup. We recommend no heavy exercise/activity for the first 4 hours after the procedure. Sorry, only “air kissing” for a couple of days, too. If you want to have your lips look their best, it is recommended to wait for a couple of weeks before attending any big events. How long till I know what will my lips will look like? You’ll have a pretty good idea when you walk out of our clinic, but it takes about 2 weeks for your lips to be totally healed. It depends on the size of your lips and your ultimate goal. One session can cost anywhere from $600-800. 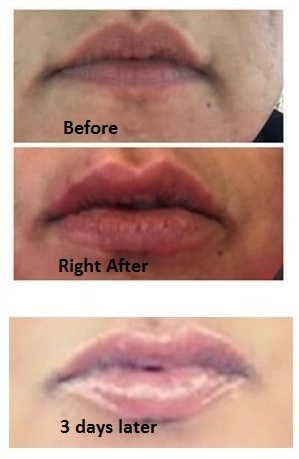 This beautiful young lady wanted a fuller upper lip and a more “pouty” lower lip. We tried to contour her lips to meet her desires.